Babs Decruyenaere uses a range of old and less old photographic techniques. Even though she occasionally uses a camera as well, she does not consider herself a photographer. She finds herself much closer to sculpting, she says, even though she does not cut, hack or chop into the round-edged stones and boulders, with their fickle lines like random drawings, that she collects along the rugged beaches she explores around Europe. So despite the closeness that she feels, she’s not really a sculptor either. What Decruyenaere does, is apply these old photographic techniques to develop an imagined form of sculpting; one that results in a flattened image on paper. What if? That is the question Decruyenaere asks herself. What if this rock had more lines? Are there any laws or conventions within the natural world about how the lines on a stone should be, so that you still see it as a stone? When do they become something else? Instead of carving additional lines directly into the stone’s hard surface, an act that would brutally alter its original appearance – that is: the stone as she found it –, she uses a technique pre-eminently know for pulling something out of the real and transfer it into an image; a technique that allows her to reiterate this process, time and again, using the same source; a technique furthermore distrusted for its inherent manipulative potential. Manipulate, then, is exactly what Decruyenaere does while making her simultaneously stark and smooth photograms. 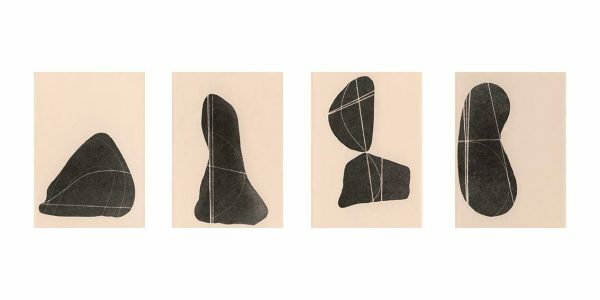 By placing the stones directly onto light-sensitive paper, she creates an abstract image; an image that conveys a two-dimensional idea of what the stone could have looked like – emphasis on could. In an enthralling entry in his notebook from 1998, German artist Anselm Kiefer expresses his concerns about a mosaic he is working on, wondering “how many tiles can be lost before it’s no longer a mosaic”. “We want to remove from the mosaic only the exact number of tiles that will let it remain something specific”, Kiefer writes. ‘Something specific’ being “a particular thing”, something that can’t be classified so easily. “A few tiles have to remain in very specific spots so the rest can be added – in one’s head.” A truly romantic mosaic, Kiefer cleverly concludes, is one that is missing as many tiles as possible. A truly romantic stone then would be one that has as many lines as possible. Decruyenaere, for her part, doesn’t care much for that sense of romanticism. In fact, she wants to stay as far away from it as possible. To her, elements of nature are all too easily associated with it. This is why the images she makes venture from the real into the abstract. At first she stays very close to the very thing itself. Gradually however, she lets the object go. She then surrenders herself to the darkroom procedure and allows herself to be absorbed by the blackened graphic shapes. In terms of forms, shapes and images, nothing feels as far removed from the natural as the graphic. In the graphic image there is not a single uneven side, not one rough edge, not an unclear line. Though it may seem like this is the goal for Decruyenaere, in the end it is not. After some time, she allows the thin and fleecy threads that make up the lines in the photograms to reveal a glimpse of their own materiality in the resulting image. Somewhere in between the natural and the graphic, in between the real and the abstract, Decruyenaere looks for her own ‘something specific’, that particular thing that arises from the question: what if we take the real beyond its image? What if we take it into the imaginary? Laszlo Moholy-Nagy, known for his experiments with photograms, wrote that one hundred years of photography have enormously enriched us all. “We may say we see the world with entirely different eyes.” For Decruyenaere, however, certain stones do not need to be transformed through the photographic medium. They don’t elicit the ‘what if?’-question; as they are, they become an image in her mind. All she has to do, she says, is see something in their form: a face, a head. And to do that, she doesn’t need her eyes. To see the world differently, she uses her imagination.